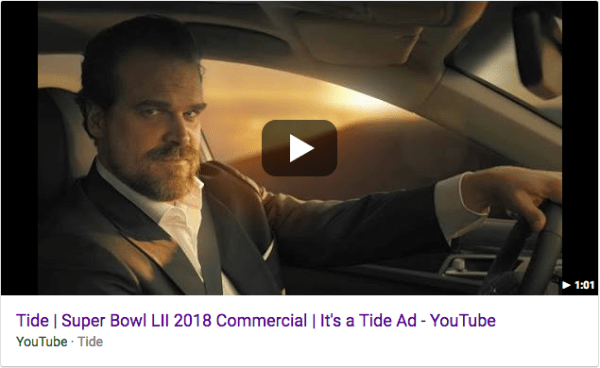 The undisputed winner of the Super Bowl Ad Game was Tide. Their ad(s) created conversation, sparked memes, and has been relentlessly referenced in the days since (including people commenting that, given the clean nature of the spacesuit, SpaceX’s launch of a Tesla was actually a Tide Ad). 1) It lets us in on the joke right away. It would have been very easy for Saatchi & Saatchi New York, the agency behind the ad, to do a full commercial and only reveal at the very end that it was Tide ad. Then we’d look at it and think, “Oh, how clever” (like at the end of Sixth Sense when you find out Bruce Willis was a Tide ad). Instead, they tell us the joke in the first 15 seconds, and then we get to see it played out eight more times in the next 45 seconds (and in subsequent 15-second spots). Now instead of thinking, “How clever” we’re just enjoying the ride and laughing along the way. 2) It has one premise, multiple punchlines. Building off the first point, by having a strong, clear premise, we immediately understand what’s going on. Then, rather than just moving on to something else, we see multiple punchlines on the same premise (called tags in comedy). This allows you to drastically increase your LPMs (laughs per minute, a real thing) in a short amount of time. 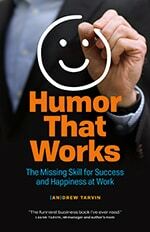 3) It combines multiple humor tools together. Association. The entire ad is a series of associations: a laundry commercial mixed with commercials for: a car, beer, fragrance, whatever the farm is referencing, insurance, diamonds, soda, mattress, razor, fitness, smart device, and laundry. Observation. The ad doesn’t just reference cliche commercial formats, it uses heightened forms of them as commentary (everyone laughing in a beer commercial, whispering “whatever” for the fragrance riff). Visual. The ad heightens the humor with exaggerated visuals in each commercial parody, like Harbour’s hair in the fragrance section and the mechanic’s oily face and crisp white shirt in the insurance part. Audio. Harbour’s voice acting is spot on but so are the background sound effects and the slightly eery music at the end (is every ad a Tide ad?). Pattern. Perhaps the strongest element of the ad is the pattern that it creates: start a cliche commercial, end with, “nope it’s a Tide ad.” It’s so clear that turning into a meme (which is a form of pattern) became very easy. And that’s just the first 60-second spot, to say nothing about the subsequent ads that came after it. So yes, the Tide Ad has been getting a lot of praise, but all for good reason and is something we can all learn a little from.